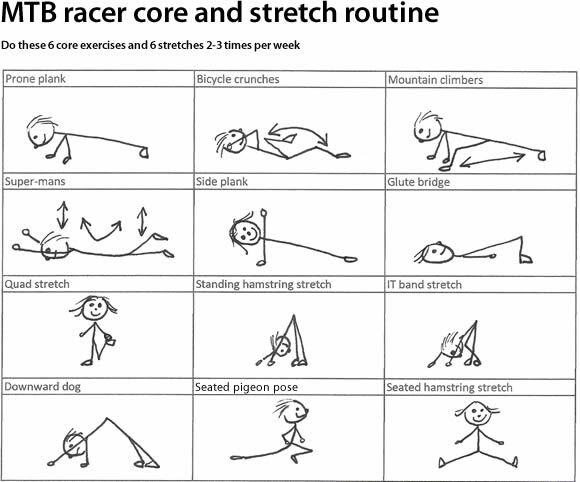 This 30 min core and stretch routine for mountain bike racers hits all the hot spots mountain bike racers need to strengthen and stretch to become stronger and more efficient racing their mountain bikes. Do this routine from #1-12, two times then end session with #13. Repeat 2-3 times per week on your non-ride days or recovery days. Front (or prone) plank. Hold for 60 seconds. Bicycle crunches. 20 each side. Do the first 10 slow and the next 10 fast. Mountain climbers. 20 each side. Do the first 10 slow and the next 10 fast. Super-mans. 40 repeats. Do the first 20 slow and the next 20 fast. Side planks. Hold for 30 seconds each side. Glute bridge. Hold for 60 seconds. Quad stretch. 20 seconds each leg. Standing hamstring stretch. 20 seconds. IT band stretch. 20 seconds each leg. Downward dog. Hold for 60 seconds. Pigeon pose. 20 seconds each leg. Seated hamstring stretch. Hold for 60 seconds. Finish the last 5 minutes of your session by repeating 1 or 2 exercises or stretches that you feel need more time. Save this simple stick figure info-graphic on your phone to guide you through the sequence. – Move through this routine quickly with little rest between core exercises to get a sweat going. Mountain climbers are designed to get your heart rate up so push them hard. – Exos has a great library of core movement exercises. Use the search box to search for videos on the above exercises and to add variations or new exercises to your routine. This workout consists of 13 exercises. For 4 rounds, program SWORKIT for 26 minutes. In the App workout settings, set your custom intervals to 5 sec transition pause, 30 sec length of exercise interval, no rest break. Set Shuffle Exercises to “off”. Pay attention to different types of discomfort. “Good” discomfort works the muscles and makes you stronger. “Bad” discomfort is felt in joints or connective tissues. Skip any exercise that generates bad discomfort. Use the “next” button in the app to skip exercises.